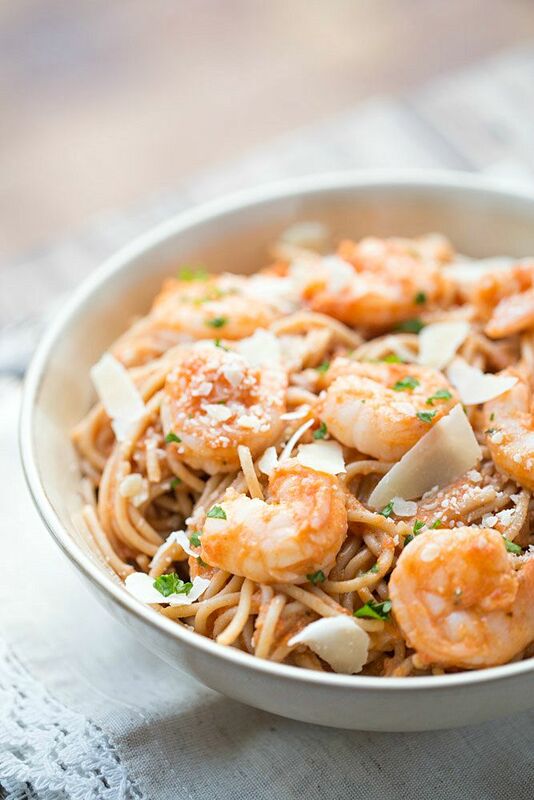 Plump shrimp are seasoned, sauteed and placed upon a bed of whole grain spaghetti that’s tossed with a simple and flavorful spicy tomato cream sauce. Parmesan and fresh parsley finish the dish off deliciously. But first, here’s a little background of how this recipe and recipe post came to be. This post comes from my This Gal Cooks blogging days. I posted this recipe a month after I started blogging in 2012. Those were the days that my photos were meh and my story-lines were even more meh. The below excerpt is the entire content I created for the original post. And below that is one of the photos I used in the post. No wonder this delicious recipe was only pinned 47 times since 2012! If you haven’t already figured it out, shrimp and other seafood are one of my favorite types of food (of course, it comes in for a close tie with Mexican food) to eat and cook with. I had some shrimp leftover from a previous recipe that I made so on Sunday, I decided to thaw them out and use them for an excellent recipe. “What type of excellent recipe would I make?” I asked myself. I checked my pantry and my refrigerator and determined that I had some cream, spicy diced tomatoes and pasta so browsed some recipes on Pinterest to get some inspiration. What I decided to make was a Shrimp Pasta with Spicy Tomato Cream Sauce. And boy oh boy was it scrumptious! Please enjoy the recipe. I’ve learned so much since I started blogging, such as how to use a camera, how to take good photos and how to edit those photos. I’ve also become more comfortable with writing and sharing stories with all of you. When I first started blogging, my writing content was limited to a couple of un-engaging paragraphs, briefly covering the recipe I was sharing. I was hesitant to open up and share stories about myself and my experiences, out of fear that people wouldn’t enjoy reading them. But I’ve realized that reading those types of posts are enjoyable, for me and many others. I also realized that getting over my fears of what others think is a step towards becoming a better me and living a happier life. This shrimp pasta is a great solution for weeknight meals because it’s easy to make and ready to serve in under 30 minutes. Each serving is under 400 calories, contains 16 grams of protein and is full of nutrients that come from whole grains. Whole wheat pasta is cooked until al dente. Plump, juicy shrimp are seasoned with freshly minced garlic and sauteed in olive oil until tender. The simple spicy tomato cream sauce is prepared in minutes by combining ingredients in a sauce pan, heating and pureeing until smooth and creamy. Half and half gives the sauce an extra boost of creaminess with minimal added calories. Once the cooked pasta is tossed with the sauce, the meal is ready to hit the serving bowls. Top each bowl with the delicious shrimp, parmesan cheese and fresh parsley. Then it’s time to enjoy. 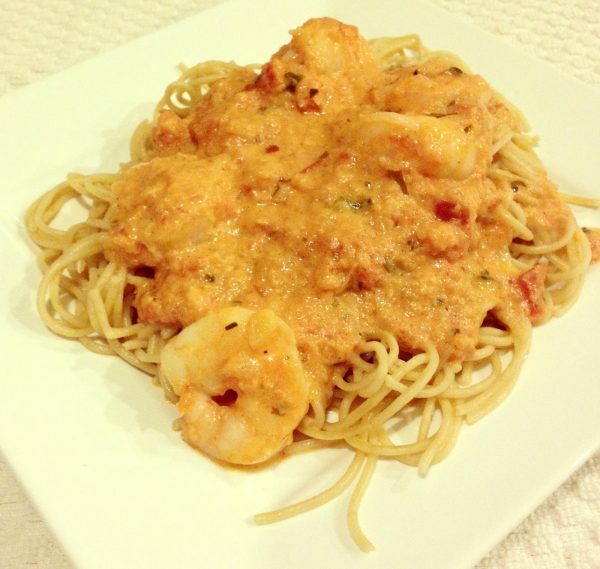 Simple and economical, this Shrimp Pasta is tossed with a spicy tomato cream sauce. Ready to serve in under 30 minutes! Bring a large pot of water to a boil. Add the pasta and cook until tender. Once the pasta is done cooking, set aside in a large mixing bowl. In a mixing bowl, combine the shrimp, 1 tbsp of olive oil and 2 cloves of minced garlic. Saute in a large sauce pan for 3-5 minutes per side. Once cooked, remove from the pan and set aside on a plate. Add the onion and 1 tbsp olive oil to the sauce pan. Cook until the onion is tender, stirring often to prevent it from scorching. Add the tomatoes, basil leaves, sugar, oregano, salt and pepper and mix well. Cook for one minute and then remove from heat. Puree with an immersion blender until the mixture is smooth. Add the half and half to the pan and mix well. Taste and add more salt and pepper, if desired. Pour the sauce over the pasta in the mixing bowl and toss to combine. I used tongs to toss the pasta and the sauce together. Place the pasta in serving bowls and top each serving with some of the shrimp. Garnish with parmesan cheese and fresh parsley, if desired. Cooking time includes cooking the pasta and the sauce. This recipe makes 4 1.5 C servings or 6 1 C servings. Addition of parmesan cheese will alter the nutrition content of this recipe. Oh wow this looks so good Julie!!!! This looks good! I'll have to keep an eye out for spicy red pepper diced tomatoes next time I'm at the store. I've never heard of them! My hubbie would love you for this recipe! We love seafood, I am bookmarking this to make for my family, thanks so much for this recipe! Thank you so much for sharing this, Julie! I can't wait to try this recipe too! Yum! I love the sound of that sauce! This looks fantastic. I can't eat shrimp but I do have mock crab meat, I could sub in. i make this but just slightly different. but it is one of my favorites! Hi Julie – Just wanted to let you know that I am awarding you with the Sunshine Award. I enjoy reading your posts and joining you at your linky party. Congratulations. Erin would love this! Me, I'm very picky lol! This looks so good. 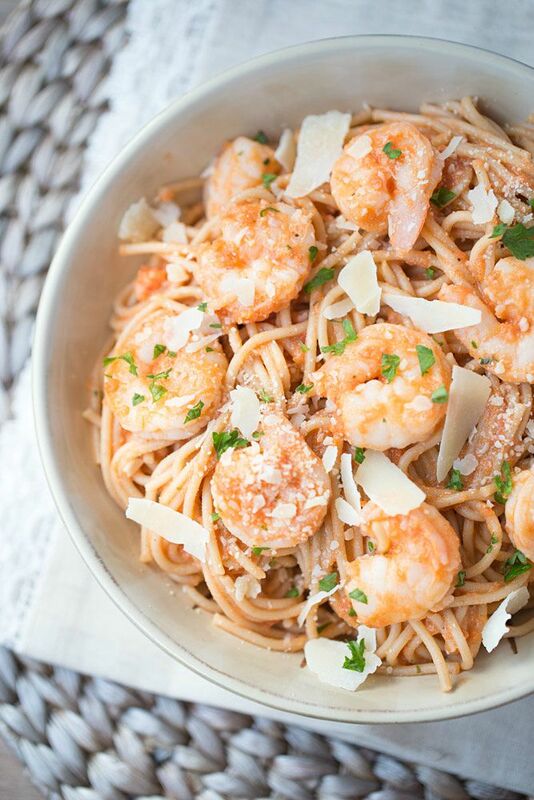 Two of my favorite things are heat and pasta, and shrimp doesn't hurt either! How about a big fat YUM for this recipe. I can't wait to try it. :) You've been featured at Wednesday Whatsits. Thanks for linking up! LOVE seeing how you’ve progressed in your photos! It’s kind of fun to look back eh? I love that you redid an old post, Julie! You’ve definitely come a long way! And I can totally relate, too. I used to love writing when I was younger and when i started my blog, I thought it would be great to get back into it again! It is hard, though! I’m still finding my voice without trying to bore people! 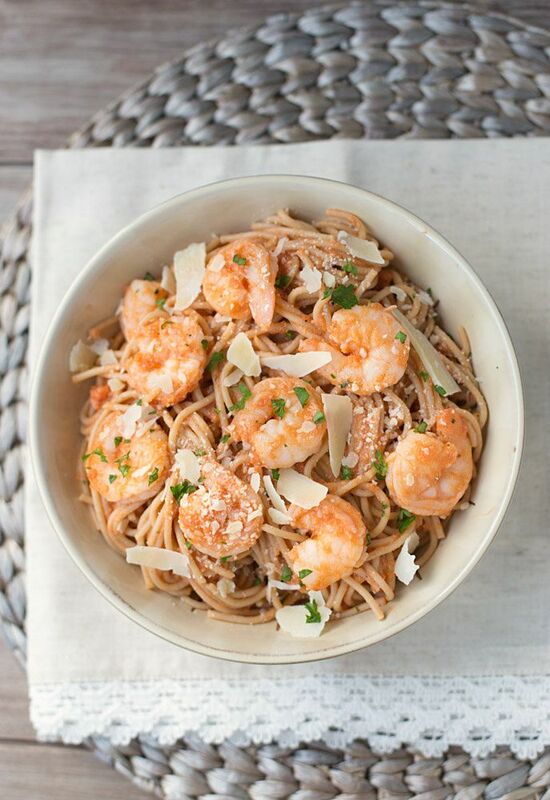 :) This shrimp pasta looks fantastic! I’m loving your tomato cream sauce, looks like the perfect touch! Pinned! A combination of all my favorite savory things – this looks delicious, Julie! This pasta looks fantastic! I love the before and after pictures, it shows how far you have come! Thanks Alyssa! It’s pretty amazing to see the difference. Seriously – I thought those before photos were decent back then. ;) Thanks so much for stopping by. Hope you have a great week! Ha! I have some of those photos. LOVE this recipe – and the new ones!! Pinned! This pasta is a dream!!! I get writers block all the time (like today) and I love seeing how far other bloggers have come. I think it gives me hope of improving myself. This pasta looks delicious! Pinning! What a difference!!! Wow!! This looks SO good, and now, I’m sure it will be pinned thousands of times!!! This. looks. so. freaking. good. OMGosh… I love the 30 min recipe, and the photos looks amazing. I’m a huge fan of shrimp (I keep 6 bags – yes 6!!! – of the Costco sized bags in my freezer). Call me shrimp obsessed! But, they are so easy to de-thaw and cook with and they are a lifesaver during the week. Nevermind they’re super healthy. And I am all for re-publishing recipes with new photos – I am doing the same lately! That. Looks. Awesome. I’ve been in a serious shrimp mood and I need this in my life. OH so have I! In fact, we went out to dinner tonight and I ordered shrimp and jalapeno grits. Holla. This looks like a perfect weekday comfort food and regarding photos I had horrible ones when I started blogging!! Your photography is amazing now girl!! I am always looking for new way to eat shrimp! Thanks for sharing! You’re welcome, Julianne! Thanks so much for stopping by! YEAH! I saw that post, too. WANTS TO EAT ALL OF IT! I love seeing the new pictures! This looks amazing and is the perfect weeknight meal. I can’t wait to try it! Julie, I love that you remade this recipe. One of my life’s regrets is that I married a man who can’t eat shrimp! Haha … only kidding, of course!! It’s amazing how much a post can change with updated photos!!! this pasta is gorgeous!!! love that you used whole wheat pasta!! What’s wrong with the old photo?? haha I so need to re-photograph some of mine too. New pics look amazing and I want to eat all of this right now! Pinned it to make soon! OMG! Haha, you crack me up, Claire! You can have the old photo, I’ll take the new one. ;) thanks for stopping by! Hope you have a great weekend! What? You reposted an old recipe to make a new one?! You’re such a rebel!!! Do you run with scissors with the sharp ends pointed up also? Ha ha! This looks amazing. I can’t wait to try it. Oh, and BTW…..thank you for reposting this. You’re right……the original picture is well……I don’t know how to say this without sounding completely offensive. But the new picture….wow…..you’ve really done it some justice since the original post! Again, thank you for reposting. No wonder you run with scissors with the sharp ends pointed up. Ha ha. HA! The original picture is horrible! It was taken about 2 1/2 years ago. I’ve gotten pretty familiar with a camera since then! Haha, I totally am a rebel. ;) Glad you like the recipe, Jason! Hope you enjoy it! I can’t find spicy red pepper tomatoes…any suggestions on a substitute? You could use regular diced tomatoes and add some chopped jalapeno or red chili pepper. Add quantity according to your taste. You could also add red pepper flakes or cayenne pepper. I’d start with a 1/4 tsp and add more, according to your preference on how spicy you like your food. Hope this helps! I love the creamy sauce for the shrimp and pasta! This was delicious! I will definitely be making it again.